Our wonderfully capable choir rehearses at 7:30 p.m. on Wednesdays, and sings in worship at 9:30 a.m. on Sundays, September through May. Whether you are a seasoned singer or are new to singing; whether you read music or are learning to do so; whether you are young or older... you are welcome! 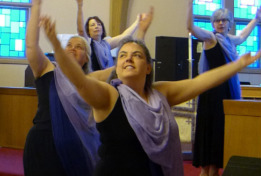 UCCNB is privileged to have a group of members who choreograph and share dances during worship. Performed on most of the bigger holy days of the year, as well as occasional "regular" Sundays, dances have been accompanied by the recordings of such artists as Sweet Honey on the Rock, Jason Mraz, Jerelyn Steele, and Amy Grant. We also strive to have live accompaniment and are developing a small musical ensemble to perform with us. This group rehearses regularly during the program year. All are welcome, regardless of age, gender, or experience. From banners to enhance our worship experience, to images on the cover of our bulletins created by our children, visual arts are becoming more and more a part of our worship life. You could help us capture great moments from our church's day-to-day activities as well as retreats or special events. We are increasing our use of images in worship and are always glad to include the works of our members. Our bell choir practices every Thursday evening at 6:00 p.m. in classroom #2. No experience in necessary to join in. They share music in worship on designated Sundays throughout the church year. All are welcome. 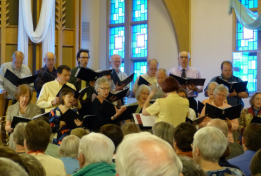 Soloists or small groups of singers or musicians often contribute to our worship services. New ideas are always welcome! Past services have included skits, artistic puppetry, and even hula dancing. Note: From the end of June to the beginning of September, we are on a "summer schedule," so some of our groups may not meet during the summer. But this is also the time when we are more able to welcome members to share their individual talents.